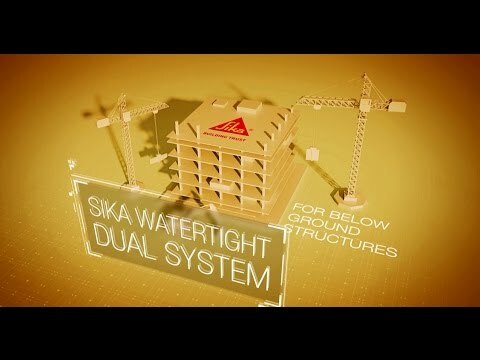 As a pre-applied solution, the SikaProof®-A membrane system can easily be applied on the blinding concrete for the base slab and to the prepared vertical excavation wall, e.g. on diaphragm walls, piled walls, or similar. Alternatively it can be applied directly onto the outer interior side of double-faced formwork in open-cut excavation. In this type of project, the shuttering anchor / tie-bar penetration holes have to be sealed after removing the formwork. Engineered structures such as retaining walls, tunnelshafts, cut and cover tunnels. Pre- and cold applied sheet waterproofing membrane system for application below base slabs, on single and double-faced formwork cast walls. SikaProof® Patch-200 B, external adhesive tape in 200mm width based on the SikaProof®-A membrane. Used to seal any penetrations, joints and in case of any damage on the outside of the membrane surface. 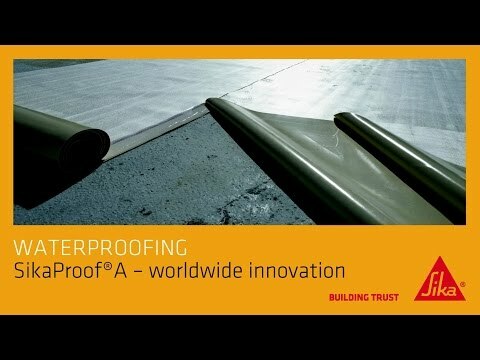 Post-applied sheet waterproofing membrane system, specially designed for roof slabs and double-faced formwork cast walls. Provides waterproofing for basements, retaining walls and more. Range of hydrophilic profiles and gun applied sealants, designed for sealing and waterproofing of construction joints and penetrations.(e.g. pipe entries).